SELECT FROM THIS LIST F007-200 | FLTR:VK70 24" ROLL | Units:100" F007-201 | FLTR:VK70 36" ROLL | Units:100" F007-202 | FLTR:VK70 48" ROLL | Units:100" F007-202C | FLTR:VK70 48" CUT | Units:LNFT F007-203 | FLTR:VK70 60" ROLL | Units:100" F007-204 | FLTR:VK70 72" ROLL | Units:100"
When applied, the V-KOOL UV AND IR BLOCKING FILM forms a virtually transparent barrier that blocks up to 65% of total heat. 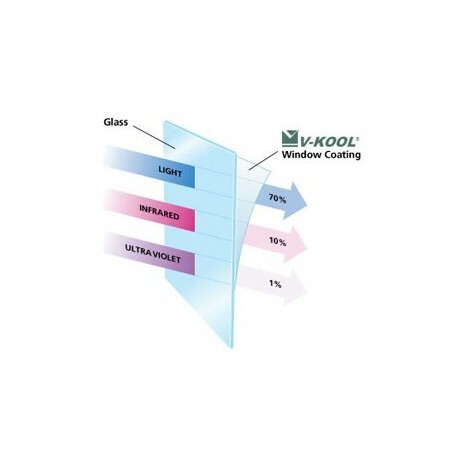 At the same time, V-KOOL eliminates over 96% of infrared rays while allowing up to 77% of visible light to enter. V-KOOL also screens out 99% of the ultraviolet light that, in combination with infrared rays, causes materials and products to fade and can damage skin and eyes. Independent testing at the Australian Radiation Protection and Nuclear Safety Agency (ARPANSA) have shown that V-KOOL coatings provide occupants with a Sun Protection Factor (SPF) of over 200. The use of V-KOOL UV AND IR BLOCKING FILM can be a great way to help control soaring energy costs, giving you less need for expensive air conditioning and electric lighting. The VK70 offers the best balance between heat rejection and daylight transmission. VK70 will allow 70% of the light to transmit while rejecting 55% of the heat. It is virtually clear with a slight green tint, and will maintain the architectural integrity. Full rolls are 100 feet. We do also offer the 48 inch width in cut lengths sold by the linear foot. For assistance checking thermal window efficiency, see this DIGITAL BTU THERMAL EFFICIENCY METER. 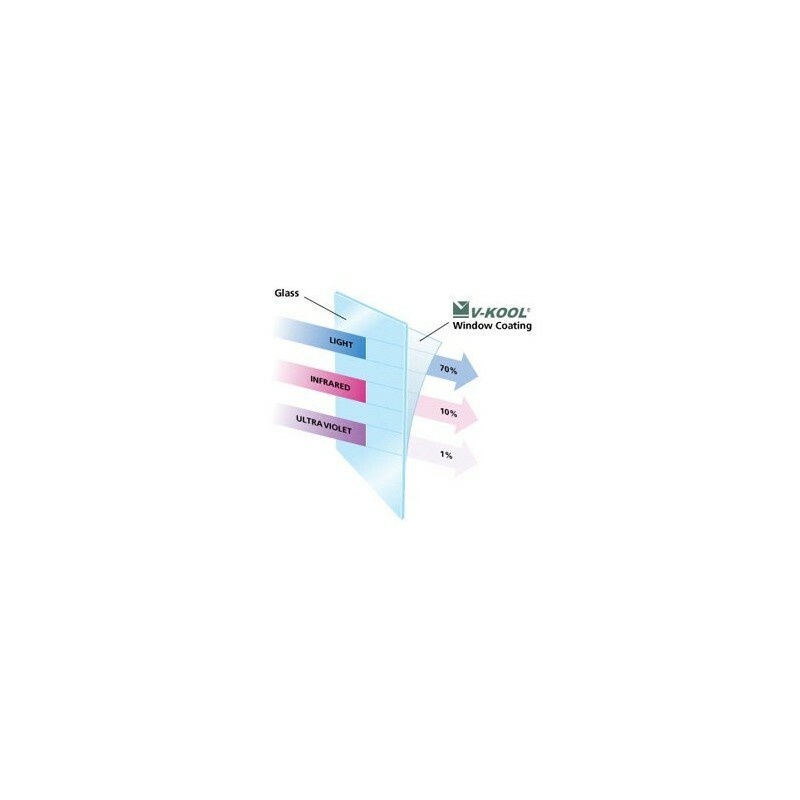 For assistance in evaluating UV filtering efficiency, see this DIGITAL UV AB RADIOMETER.